Get the latest FNS41815 Certificate IV in Financial Services training resources and assessment tools from Australia’s leading learning resource developer! Start delivering training as quickly as possible using this quality package of RTO training resources! These high-quality RTO training materials from the Compliant Learning Resources development team are designed to help you get a quality, compliant FNS41815 course up and running at your RTO. Get a complete FNS41815 Certificate IV in Financial Services training and assessment resource kit so your RTO can deliver and assess this super popular FNS41815 Certificate IV in Financial Services qualification! These FNS41815 Certificate IV in Financial Services Learning & Assessment Resources have been designed so you can deliver critically needed, high-quality financial services training to your students. Compliant Learning Resources will provide you with RTO training materials designed to help your students develop the skills and knowledge required to work effectively in a wide variety of financial services-related roles. You will receive an unlimited student license, meaning you can deliver and assess training to as many students as you want using this training resource. We also supply crucial mapping documents! All assessments are mapped directly against the relevant unit of competency and go through multiple rounds of validation and subject matter expert review during development to ensure every competency requirement has been assessed using appropriate methods of evidence collection. We will back you up with our audit guarantee on these training resources. Unlike many FNS41815 Certificate IV in Financial Services training and assessment materials packages which only include facilitation tools, or assessor guides and assessment workbooks, Compliant’s financial services training packages come complete with all Learner Guide and Assessment Tool content in digital format with an unlimited student license. This means you will not be reliant on purchasing hard copy learner guides, assessment workbooks or textbooks for every student – expenses which can easily add up to hundreds of dollars per student! When you do the break-even analysis, our Financial Services resources will pay for themselves with a less than one class of students, and then you are free to deliver and assess FNS41815 training for years with no ongoing per-student materials fees! The FNS41815 Certificate IV in Financial Services course assumes your students have access to a workplace in order to access financial records, case studies, workplace policies and procedures, forms, templates and other documents. The reality is many students do not have a job in the financial services sector when they are studying, or may be international students who do not have the right to work in Australia. Compliant has developed simulated online financial services businesses to assist your learners to access workplace scenarios and resources without having to worry about access, privacy or confidentiality problems. Your students will log into the Simulated Workplace and access simulated financial records, business resources, policies, procedures, templates, forms, and other files or materials they require to complete assessment tasks in the assessment workbooks. Easy access to the workplace resources required to complete assessment tasks also potentially increases your student completion rate – important for contract KPIs and completion stats & student satisfaction at your RTO is now examined by auditors in the new ASQA audit model. Unlimited Student License for FNS41815 Training! Your FNS41815 Certificate IV in Financial Services materials are provided on an unlimited student license for the lifetime of the qualification release – meaning no ongoing resource fees or licensing costs for the use of these training materials! Deliver training to as many students as you want in your RTO which will typically save you a fortune on resource costs over the lifetime of this qualification. Unit by unit FNS41815 Certificate IV in Financial Services RTO training materials! This qualification is written unit by unit so you can select from our range of elective units to design your ideal qualification packaging. Don’t forget to order extra elective units so you can offer a selection of specialised course outcomes to your students and to meet industry needs. In our experience, this flexibility is ideal for FNS training package qualifications so you can tailor training outcomes to specific industry and business needs. One of the true tests of compliance… you must have quality assessment benchmarks so your assessors can produce consistent, correct assessment judgements or else you risk passing not-yet-competent students leaving you exposed to non-compliance at audit! Assessment benchmarks are one of the key components of your tools reviewed by auditors at audit – making it critical you have quality, fully mapped benchmark answers to every question in your assessment tools. Good assessment benchmarks will help support and get better results from compliance processes such as moderation and validation too. All training package requirements are mapped to assessment tasks in a mapping matrix, and there are additional mapping notes on each question in the assessor guide! Comprehensive assessment tool mapping is essential for day-to-day training delivery, and vital when you go to audit. It also makes validation quicker and easier, important when you are required to conduct regular validation as part of your ongoing RTO compliance obligations. 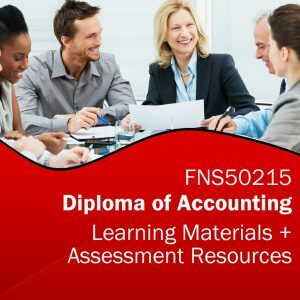 Enquire now and get this premium FNS41815 Certificate IV in Financial Services learning and assessment resources bundle for your RTO today! Plus, we have additional units available from the Compliant Learning Resources catalogue of RTO training materials that may meet the packaging rules. We may also be able to offer training resources from third-party publisher catalogues that would also fit meet the FNS41815 qualification packaging rules. These training resources developed by Compliant Learning Resources are provided on “One-Off” License Fee with Unlimited Students – meaning you pay one upfront fee and there are no ongoing per-student or annual license fees for the lifetime of the qualification release. Please notify us in writing in advance of your upcoming audit. If for some reason your auditor isn’t satisfied with the assessment tools and believes rectifications are required, contact us on the day so we can provide additional guidance on the application of the tool and if possible discuss with the auditor. If the auditor still isn’t satisfied, provide us with a copy of the official audit report as it relates to this training resource. We’ll be happy to complete the recommended rectifications required to comply with the auditor’s feedback within 21 business days. The FNS41815 Certificate IV in Financial Services training resources and assessment tools were developed by Compliant Learning Resources’ in-house development team. Compliant will provide licensing, updates and ongoing support for this product under the terms and conditions offered in their licensing agreement. See the Compliant Learning Resources licensing conditions page for more information.